First of all, why Matthew 5:9 isn’t talking about cops….. The Greek word translated “peacemakers” in Matthew 5:9, eirēnopoios, is only found once in the entire Bible. In Colossians 1:20 we see a closely related Greek word is translated “making peace”, eirēnopoieō, and it is also only found once in the Bible. 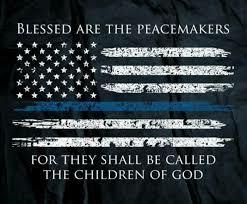 Matthew 5:9 Blessed are the peacemakers (eirēnopoios), for they shall be called sons of God. Colossians 1:19-20 For in him all the fullness of God was pleased to dwell, and through him to reconcile to himself all things, whether on earth or in heaven, making peace (eirēnopoieō) by the blood of his cross. We’re to be makers of peace with our fellow man, as Christ was a maker of peace on the cross. What kind of peace did Jesus make on the cross? To answer that question we’ve got to understand WHY Jesus had to die on the cross to begin with. God the Creator made man in His image. God placed man in a perfect place, gave him a perfect companion, and intended for man to live forever in that state. But man’s selfishness led him to eat the forbidden fruit, bringing about death, an end to his life in Eden, and most importantly….guilt. It’s that guilt that keeps us separated from God, a God who wanted man to live forever and to commune with us in Eden, a God who has now prepared a place for us in Heaven to live with Him forever in a new, undefiled body. But God’s holiness won’t let Him overlook that guilt that still exists. God is righteous, and righteousness demands that the debt of our sin be paid. God knows that we can’t pay that debt. So in order to be reconciled back to His creation, in order to redeem that family relationship and allow us to spend eternity with Him….God paid the debt for us. God took on the form of man and sacrificed Himself on the cross. The natural and logical sentence for our rebellion against God is Hell. But God’s love overcame the natural and logical sentence we deserved. And that’s the kind of peacemakers we should be. When a police officer “makes peace”, he makes peace by force. When a bank is robbed no one expects police officers to show up and set the robber free, refilling the empty vault out of their own pockets. When a murderer is caught no one expects an officer to love the suspect enough to show up in court and be sentenced in his stead. That’s not how the police “make peace”. The police make peace by chasing, fighting and sometimes even by killing very bad people, so that others can live in safety. God made peace in just the opposite way. He paid the debt the robber couldn’t, he endured the death sentence we all deserve. Police officers facilitate the natural and logical result of guilt. And that’s exactly what God refused to do. When we are wronged God calls us to make peace with our fellow man in the same way that He has made peace with us. When we are struck, to turn the other cheek. When we are oppressed, to go the extra mile. When someone would take advantage of us, we should give away not only our tunic but our cloak as well. This is a tremendous task, one that I fail at daily. But it is undoubtedly what Christ is referring to in Matthew 5. Not demanding justice at the hands of the government, but sacrificing ourselves when others won’t. But isn’t this an insult to cops? No. In fact, it’s just the opposite. The whole concept of law, and law enforcement, is sanctioned by God. Romans 13:1-4 Let every person be subject to the governing authorities. For there is no authority except from God, and those that exist have been instituted by God. Therefore whoever resists the authorities resists what God has appointed, and those who resist will incur judgment. For rulers are not a terror to good conduct, but to bad. Would you have no fear of the one who is in authority? Then do what is good, and you will receive his approval, for he is God’s servant for your good. But if you do wrong, be afraid, for he does not bear the sword in vain. For he is the servant of God, an avenger who carries out God’s wrath on the wrongdoer. There are those in our communities that are oppressed and defenseless, unable to protect themselves from the very bad people who would abuse them. And to those people God has sent servants. But look at the language in Romans 13…. Those servants are a terror, striking fear into those that resist authority. Those servants bear a sword, not in vain but for justice. Those servants are called avengers that carry out God’s wrath. Perhaps our society has taken to calling police officers “The Peacemakers” because that’s what we really want them to be. We want to be able to call 911 and have police officers come sprinkle magic dust around to make everything better. It would be great if that were the case, if cops could just show up to a bad situation and “make peace”, as if they were some mystical Buddha who could simply bring about peace with warm hugs and words of encouragement. Perhaps we want to think of our police officers as Barney-esque creatures that can sing away our troubles, because if they are….our troubles must not be that bad after all. But the honest truth is that in our communities there are troubles that are that bad after all. Maybe not for you, but if you don’t have bad troubles then you probably don’t need the police anyway. For some people, for those defenseless and oppressed, there are bad troubles in their life. And sometimes those troubles can only be solved with force, with that sword that God’s servants bear to carry out God’s wrath on the wrongdoer. When the police use force against criminals, it shouldn’t come as a surprise to us. That’s their job. They do a great many other things as well, from bicycle safety classes for kids to teaching drug awareness to middle-schoolers. But those things are incidental to their true calling, the calling that too many people in our society have either forgotten or choose to ignore, the calling to bear a sword against wrongdoers. When we ignore that task that God expects of them, when we choose to think of them only in peaceful terms, we place an enormous burden on our police officers. Police officers are called to do the dirty work that society doesn’t want to deal with. If they weren’t called to do it, no sane person would. But they are called and all too often today that call is to solve incredibly complicated and dangerous problems without using any sort of force…because, after all, they should be making peace. They’re called to deal with the most violent people, doing the most violent things, without being violent themselves…because, after all, they’re peacemakers. That expectation, the view that police officers should only make peace, while dealing with the most violent, the most dysfunctional, the things we don’t want to deal with, is just completely unreasonable. The real insult to police is ignoring their God given mandate to bear His sword against wrongdoers. And it’s not just an insult to them, it’s an insult to ignore the plight of those defenseless among us who need that sword for their protection. Hang a sign in your front yard to support the police but don’t let it talk about peacemakers, let it talk about how they make peace….with a sword. Well done. I have missed your blog posts. Well said. This is something that society needs to realize…as well as our politicians & law enforcement leaders!